The critically acclaimed and internationally award-winning production of Mary Poppins, seen by over 11 million people worldwide, will return to London and the Prince Edward Theatre in 2019 and will star Zizi Strallen and Charlie Stemp. Mary Poppins stars Zizi Strallen, who returns to play the title role following great acclaim on the recent sell-out international tour and is currently playing Fran in Strictly Ballroom The Musical at the Piccadilly Theatre, and Charlie Stemp as Bert, who last year gave an award-winning performance as Arthur Kipps in Cameron Mackintosh’s production of Half A Sixpence and recently made his Broadway debut in Hello, Dolly! with no less and actress than Bette Midler! 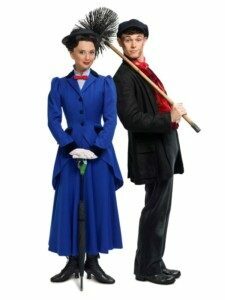 Theatre Breaks for Mary Poppins are now on sale. The multi award-winning creative team for Mary Poppins, which originally opened in the West End fourteen years ago, is led by director Richard Eyre, with co-direction and choreography by Matthew Bourne, co-choreography by Stephen Mear, set and costume designs by Bob Crowley. Of course this means bye-bye to Aladdin, but you have a few months to organise a theatre break to see it before it closes!